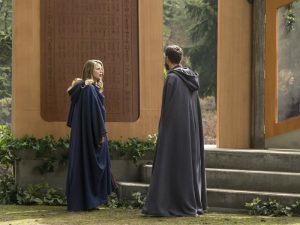 When Supergirl and Mon-El investigate a nearby meteor they discover a Kryptonian city on the surface -- her own home of Argo, where Kara's mother is alive and well. Back on Earth Alex is targeted by an assassin. Last edited by GateWorld; June 14th, 2018 at 01:09 PM. Interesting episode. It took me a while to realize who was playing Kara's Mom. Something I found odd. Why hasn't alura aged? Kara spent 25 years in the phantom zone, another 13 or so years on Earth. That a long time. Shouldn't Alura be really really old? Sometimes, you just have to enjoy the show for what it is. There was no indication that Alex wasn't concerned for Kara. Alex was trying to be a Mom to Ruby and keep her sane while Kara and Mon-el were trying to save her Mom. I think there is something more there...meaning I'm not quite certain things are as they appear with Kara's Mom. Harry Potter is alive in alt Earth? Umm.. Am I the only one that noticed Alura totally forgot about her other child, Kal-El, aka Superman? She told the council that she sent her only child away, 'cause they didn't know Argo would be survivable or not. Maybe I have a basic misunderstanding. Superman's parents sent him to Earth as Krypton was tearing itself to bits (1978 Film) At the start of this series, it was told that there was another child, Kara, who was also sent to Earth to look after Kal-El, but ended up 24 years late. Yes...but Kara has ALWAYS been Kal-El's cousin...not sister. She was his cousin in the Supergirl movie, the current Supergirl series, and in Smallville. And her name is Kara Zor-El.